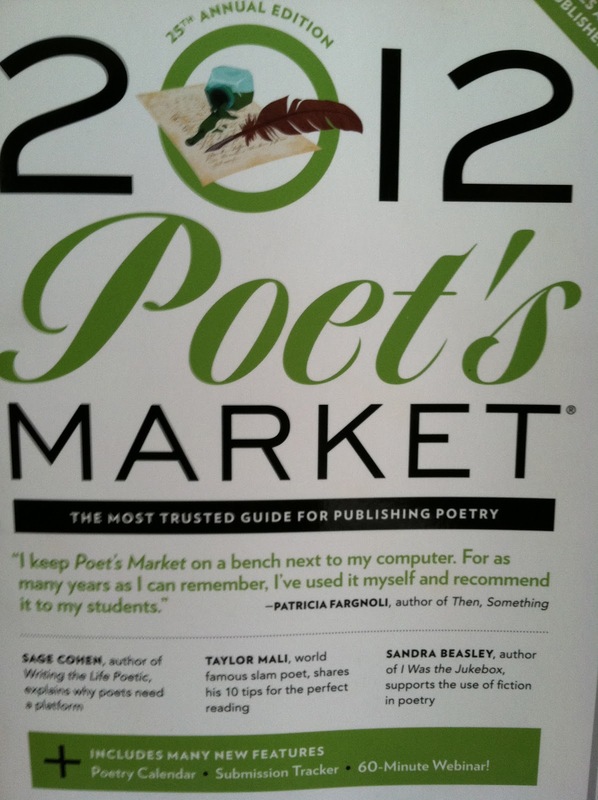 I had the honor of being featured in both this year's 2012 Writer's Market and the 2012 Poet's Market (25th annual edition! ), thanks to the good graces of editor Robert Lee Brewer and Writer's Digest. For WD I had a conversation with Robert on how I'd made the leap from poetry to memoir, the struggle to write and deal with my food allergies while on book tour ("a diet of French fries and limp house salads"), and what I value about keeping a blog. As the introduction notes, I was in Mississippi at the time. My host there was not thrilled that I was sinking hours into typing up answers to interview questions--that was time he thought I should be spending on poems--and I wondered if it was worth it. When I saw these books, I knew: absolutely. Not only in terms of the career recognition, which is thrilling, but because I get to contribute to a line of books that helped me out when I was getting started. I have strong memories of being a high school senior and hunting through the shelves of Fairfax County's Tysons Pimmit Regional Library. The year was 1997; the edition was pumpkin-orange. Later, in college, I asked for my own copy at Christmas so I could properly dog-ear and underline (2001; it had a broad black band on the cover that made "POET" jump out). That Poet's Market was where I found the submissions listing for Rosebud, the first journal publication of mine that ever felt "official" & national. The issue in question had a bare-breasted woman wearing a bunny mask on the cover; I can still remember my mother's quizzical expression. But they'd published Stephen King! And Ray Bradbury! I was walking among gods. Nowadays, the internet makes it easy to take for granted the availability of this kind of logistical data. But the truth is that the Writer's Market and Poet's Market databases still offer the best searchable, accurate, and specialized-by-genre information out there. For this year's Poet's Market, I contributed a craft essay to dovetail with Collin Kelley's "Truth and Consequences in Poetry"; mine is "A Different Take on Truth & Poetry," and champions the acceptance of fiction into our voices. In the opening I define different approaches to using truth in poetry: the gardener-poets (for whom truth is the soil), the chef-poets (for whom truth is an ingredient), and folks like me..."I love to lie. And even when I'm telling the truth, I'd rather you assumed I was lying." 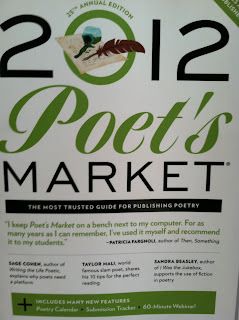 When I saw I made the cover, my heart skipped a beat--especially being in a line-up with Sage Cohen and Taylor Mali. The second best surprise: my mother's hugely enthusiastic response to my essay. Maybe she liked that I used the metaphor of art, her realm: "Sometimes I wish poets were more like painters, who are reminded of the artificiality of their materials every time they prime a canvas or mix a palette. To paint in blood-red is not the same as to render in blood, no matter how nuanced your balance of sulfur and mercury." Maybe she liked that the essay adds to her arsenal of proofs that all my poems aren't really about our family. The infusion of interviews and essays into this most recent generation of Markets has really upped their value. This year's Poet's Market includes not only the headlining pieces from Taylor Mali ("10 Tips for the Perfect Reading") and Sage Cohen ("Why Poets Need Platforms: And How to Create One"), but also Q&As with Erika Meitner and Aaron Belz, as well as a compelling guide to offering private workshops as an alternative career path and reaching more readers through Twitter, Facebook, and LinkedIn. Writer's Market gets down to the brass tacks of publishing, including how to adopt the mindset of an entrepreneur, negotiating a contract, and figuring out how much to charge. One of the things that appeals to me about turning here for guidance is that we can be honest about how much we make, how much we want to make, and how much gets siphoned away by things like postage and printer ink. There's none of the artificial inflation that can happen when a bunch of freelancers belly up to the bar for shop talk. Sometimes people request to be my friend on Facebook purely to ask "How can I get a book published?" I don't mind helping, but I just wish they'd turn to these resources first. I think they'd find everything they need. 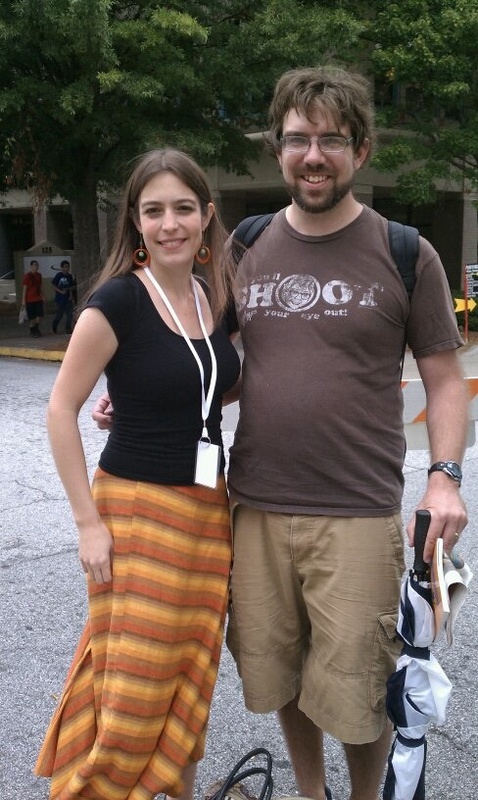 Putting out these kinds of annual guides is a draining job, and so we all owe a huge thanks to Robert (who I had the pleasure of bumping into at this year's Decatur Book Festival--here we are) and his staff of tireless editors and proofers at Writer's Digest Books. Thank you for taking some of the mystery out of the publishing process. Thank you for treating information on how, where, and to whom to submit our work not as the means to gatekeep or exclude but rather as practical matters, answers that should be made democratically available to all. Our poems find better homes, our essays get faster response times, and our stories get told. Thank you for nourishing the dreams of thousands of writers--including this particular Chick Who Digs Poetry.